In 20 patients with cubitus varus, a clinical test suggested by Yamamoto et al (1985) was carried out to measure the internal rotation. Average internal rotation was found to be 37.5 +/- 9.390. A correction for internal rotation was carried out for all the patients having angle more than 20 degrees. Following osteotomy, post-operative Yamamoto's angle was measured and was found to be 8.85 +/- 6.5. An experiment was carried out on postmortem human humerus with cubitus varus. The internal rotation was measured with Kirschner wires and was found to be 30 degrees. Osteotomy was carried out to eliminate varus and correct internal rotation. Radiographs taken before and after the osteotomy confirmed the correction. We conclude that this derotation has to be corrected and Yamamoto's test should be used to assess the correction. Sixty-eight patients with primary glaucoma involving 68 eyes were divided into two groups: Group I eyes were subjected to trabeculectomy (n = 38) and Group II eyes underwent trabeculectomy followed by subconjunctival injections of 5-fluorouracil (35 mg) (n = 30). After one year follow-up, Group I eyes exhibited reduction of mean intra-ocular tension from 45.7 mm Hg (pre-operative) to 16 mm Hg; optic disc cupping remained unchanged and 24/38 eyes (63%) were found to have field defects (19/38 i.e. 50% had preoperative field defects.) Group II eyes showed a reduction of mean intra-ocular pressure from 47.3 mmHg to 9.3 mmHg after one year. Mean cup disc ratio was lowered from 0.50:1 to 0.46:1 and 17/30 eyes (57%) which had field defects initially continued to exhibit the same. Complications in Group I and II eyes were shallow anterior chamber [8/38 eyes (21%) from Group I and 8/30 eyes (26%) from Group II], posterior synechiae formation in 10/38 eyes (26%) and 8/30 eyes (26%) and cataract progression in 13/38 eyes (34%) and 12/30 eyes (40%) respectively; only Group II eyes had transient superficial keratitis in 9/30 eyes (30%) and thin blebs in 6/30 eyes (20%). 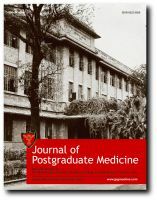 The use of 5-fluorouracil after trabeculectomy for primary glaucoma resulted in lowering of intra-ocular pressure, eliminated the need for antiglaucoma medications post-operatively, reduced the galucomatous cup size, and prevented progression of field loss without having a significantly increased complication rate. Tinospora cordifolia (Tc) is an Indian medicinal plant with proven immunomodulatory activity. This study was performed to elucidate its possible mechanism of action. 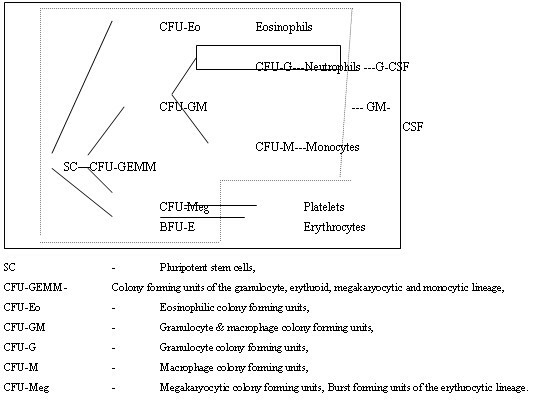 We measured CFU-GM Cotony forming units of the granulocyte-macrophage series in serum of mice treated with Tc. We found that 10 days treatment with Tc (100 mg/ kg/d) induced a significant (p < 0.01) increase in the number of CFU-GM (255 +/- 49.32 vs 38.51 +/- 9.98) This suggests that activation of macrophages by Tc leads to increase in GM-CSF which leads to leucocytosis and improved neutrophil function. In 28 children, with bacteriologically and/or serologically diagnosed typhoid fever treated at KEM Hospital, Bombay in 1991, initially one of the three recommended drugs (viz. chloramphenicol, amoxycillin or co-trimoxazole) was given for 7 days for defervescence to occur. In those who failed to respond, a second trial of therapy with one of the other two drugs was initiated, after omitting the first drug. A second failure of therapy was taken as an indication to use ciprofloxacin singly. Eventually, 18 (64.3%) cases responded to chloramphenicol or amoxycillin or co-trimoxazole. Ciprofloxacin was used in 19(35.7%) cases. the failure rate of treatment with chloramphenicol was 50%, with amoxycillin 71.4%, with co-trimoxazole 75% and 0% with ciprofloxacin. An analysis of the 28 cases revealed that apart from fever (in 100%), splenomegaly (in 82.1%) was the most important clinical pointer to diagnosis, along with absolute eosinopenia (in 71.4%). There were no major complications, except 2 cases with typhoid hepatitis who responded to choramphenicol and co-trimoxazole, respectively. Blood culture grew Salmonella typhi in 7 cases, of which 5 (72%) were multidrug resistant S. typhi. There were no characteristic clinical features to identify multi-drug resistant typhoid fever. In the patients with Hallermann-Streiff Syndrome, presence of mandibular hypoplasia and microstomia results in difficult intubation. The anaesthetic management of a three month old child with this syndrome for lensectomy is presented in this report. There was difficulty in maintaining the airway patency during induction which was solved with the help of a modified, improvised airway. Intubation was done after induction with a combination of inhalational and intravenous anaesthetic agents and muscle relaxant. Recognition of this syndrome should alert the physician to the possibility of difficulty in airway maintenance. 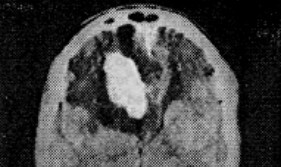 A 45 year old woman with bifrontal headaches and progressive diminution in vision over 6 months was found to have bilateral papilloedema. CT scan showed large right frontal lesion with surrounding oedema. Right basal frontotemporal craniotomy was performed to excise the multinodular, intraparenchymatous tumor. Hispathology confirmed the diagnosis of schwannoma. Post-operative course was uneventful with disappearance of pre-operative signs and symptoms. Six male patients (age group: 30-60 years) with aneurysm of the splenic artery presented with massive upper gastrointestinal tract hemorrhage. Five patients presented with hematemesis and one with melena. 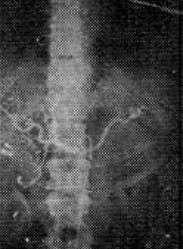 Chronic pancreatitis was noted in all the patients, four of whom were chronic alcoholics. Endoscopy was not useful in diagnosis. Bleeding through the Ampulla of Vater was seen in the patient with melena. Angiography was diagnostic in all. Pancreatic resection including the aneurysm(2), and bipolar ligation with underrunning of the aneurysm (3) were the operative procedures. Distal pancreatectomy with pancreatogastrostomy was carried out in the patient with hemosuccus pancreaticus. If endoscopy is inconclusive, angiography and early intervention is recommended to reduce the high mortality associated with conservative management. Delusional disorder-somatic (parasitosis) type is a rare psychiatric disorder which poses a challenge to diagnostic and therapeutic skills. Pimozide, a highly specific dopamine blocker has shown promising results in the 3 cases illustrated here. These cases were seen over a period of 3 years. All the three patients believed that an insect has entered through the ear and is burrowing tracts/laying multiple eggs. They approached the ENT surgeons or neurosurgeon with a fear that their brain will be invaded. On psychiatric evaluation, no past or present history of major psychiatric illness was found. Premorbid personalities were well adjusted. Only for two patients, acute moderate stressors were detected. Delusions disappeared by the end of 2 wks but therapy was continued for 5 months. An 11 year old girl presented with gradually increasing swelling over left scapular region and limitation of movements. On examination, a mass with firm to hard consistency was found fixed to the scapula. Clinical diagnosis of fibromatosis was confirmed by needle biopsy. Radical excision of the tumor was carried out and the resultant large exposed area was covered by transpositional rotation of trapezius myocutaneous flap. Microscopic examination of excised tumor revealed spindle shaped elongated cells in the form of whorls and trabeculae. The post operative course of the patient was uneventful with no evidence of recurrence at the end of 22 months. 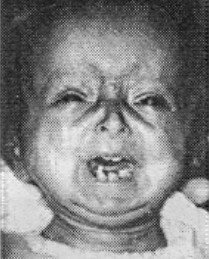 A one month old male child presented with respiratory distress since day 10 of life. There was intercostal retraction and decreased air entry on the right side. Investigations revealed a well defined cystic mass in the posterior mediastinum with vertebral anomalies, the cyst was excised by posterolateral thoracotomy. Histopathology revealed it to be an enteric foregut duplication cyst.